It was raining outside, but it was bubbling inside. Glasses of champagne perched throughout the room in hands that usually held pens and books. I have never seen so many brilliant writers in one room in my life. Ron Carlson crouched before us at Check-In. “What’s my name? I can’t remember,” he joked. Katharine Coles came to check on us! Alan Lightman shook our hands and asked our names. Eloise Klein Healy smiled at us from across the table. Nicelle Davis arrived in her red satin dress accessorized by the faded patter of raindrops. With that, our very healthy meals arrived. Every meal was gluten-free and pescatarian friendly. The salmon was light and flavorful, the polenta soft and calming. After lunch, the readings began. Jill Bialosky, Alan Lightman, and Rita Dove were powerful and moving readers. They glowed with profundity. With so many writers in one room, the air was charged. You could feel the listening. And so, here are five things I learned at the Red Hen Benefit 2016. 1. Dana Gioia is not a woman. He is a very beautiful looking man. For the last few weeks, I have been seeing the name everywhere. I imagined a woman with greying hair and wise eyes. I was very wrong. 2. Ron Carlson is funny. For some reason, I didn’t expect Ron Carlson to be funny. His name is so serious. I had seen the covers of his works, and they were all natural landscapes. I imagined a serious, Southern tragic man. Again, I was very wrong. 3. The literary world is very small. In college, I learned that the in the past, literary scene was very small and everyone knew everyone. William Carlos Williams and Ezra Pound were University friends. But that was when the world was a lot smaller, or at least fewer people could afford to be published. Now the world is huge and publishing is practically free! And yet, the literary world is still very small. Ex. Gabriel Jesiolowski, author of As Burning Leaves (Red Hen Press 2017), was mentored by David St John who also taught Jill Bialosky, author and editor at WW Norton, who edited Rita Dove’s Collected Poems: 1974-2004 who gave advice to Kate Gale when she was a professor at Arizona State University who is the managing editor of Red Hen Press who is publishing Gabriel Jesiolowski’s book. 4. Rita Dove took up ballroom dancing classes with her husband after their house burned down. From this devastating loss, Rita Dove and her husband found a way to create joy. It was from her dancing experience that Dove found the inspiration to write the award-winning poetry collection American Smooth. Rita Dove really knows how to turn lemons into lemonade. 5. 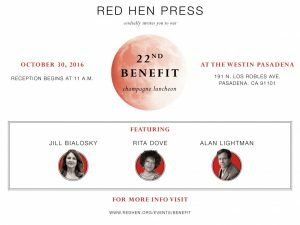 Red Hen Press plans to create a Literary Center in Pasadena. YIPPEEEEE! How exciting! Finally, there will be a literary center in the suburbs. No need to become part of the traffic into Los Angeles to engage, there will be a hub in Pasadena, too! Overall, the Red Hen Benefit was a wonderful event. There were so many great auction items from a trip to St. Lucia to a signed poster by Arnold Palmer. Red Hen Press is truly fostering a literary community and I am so honored to be a part of it.